Labour has held Reading Borough Council, despite the Conservatives gaining two wards. The Liberal Democrats and Labour each conceded a seat to the Tories, the Lib Dems lost Tilehurst and Labour lost Kentwood in Thursday's local elections. Wokingham Borough Council's deputy leader was one of four Conservatives to lose their seats, but the Tories remained in overall control. In Slough, Labour held control, increasing its majority by four. A third of seats were up for election at all three councils. In Reading, Labour now has 30 seats, the Conservatives 12, the Green Party has three and the Lib Dems remain on one. Labour has 34 seats in Slough, the Conservatives have seven, with one independent. In Wokingham, the Conservatives have 42 seats, the Lib Dems have eight, Labour has three and there is one independent. 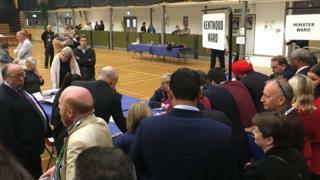 BBC Radio Berkshire political reporter Patrick O'Hagan said one of the the biggest surprises of the night came in Wokingham where Conservative David Lee, the council's deputy leader, lost his seat. "Gasps echoed round the count as that most unexpected of results came through," he said. "But it still leaves the Tories with a huge majority." Meanwhile in Reading, Labour's Ellie Emberson, 19, made history when she won the Minster ward to become the youngest woman ever elected to the council.